No, John, the Midwest was selected because it had a comprehensive plan with a regional approach, and with all Midwest states on board a collaborative effort to make Chicago the hub of an expansive network of fast trains that go to many, desirable destinations. The Midwest was also selected because many of the Amtrak routes showed increased ridership over the past three years (2006-2009), and the ones that received a higher state subsidy or targeted improvements (with fundingÂ from the states) that reduced travel time and increased reliability showed an especially high increase in ridership. And excuse me, Florida received a lot of money for a high-speed train between Tampa, Orlando, and Miami. View more of my articles on this expanding topic. President Barack Obama was in Tampa, Florida, Thursday morning to announce the winners of the high-speed intercity passenger rail funding from the American Reinvestment and Recovery Act (ARRA). The best coverage of this topic is on The Transport Politic. View a spreadsheet summarizing all of the high-speed rail corridors, their award amount, and investment projects. I prepared this document based on the press releases from the White House Press Office. With these press releases, I also created the construction summary below. The Acela, a train traveling fromÂ Washington, D.C., to Boston via Baltimore, Philadelphia, and New York, is the country’s only high-speed rail, achieving a top speed of 150 miles per hour for only a few minutes. Photo by Jonathan Rissmeyer. New track and signals on theÂ New York – Albany – Buffalo corridor. New track on theÂ New York – Montreal corridor. Track will be restored/repaired on theÂ Boston – Portland – Brunswick corridor. A station will be built in Greenfield, MA, a station restored in Northampton, MA, and 11 new miles of track in CT, on theÂ New Haven – Springfield – Burlington – St. Albans corridor. Two stations will be renovated in Troy and Battle Creek, MI, and a new station built in downtown Dearborn, MI, on theÂ Pontiac-Detroit-Chicago corridor. Also on theÂ Pontiac-Detroit-Chicago corridor, aÂ flyover, approach bridges, embankment and retaining walls will be built in Indiana. Construction in Illinois on the Pontiac – Detroit – Chicago corridor includesÂ the relocation, reconfiguration, and addition of high-speed crossovers and related signal system improvements, rail line additions at two locations, and the creation of a new passing tracks. In Iowa, findÂ four, new, remotely controlled powered crossovers on the BNSF Ottumwa subdivision. Cities in Ohio will see various construction projects on theÂ Cleveland – Columbus – Dayton – Cincinnati corridor, including new stations and upgraded track. Illinois becomes the center of attention again on the Chicago – Milwaukee corridor, with various track and station improvements. New stations will be built along theÂ Milwaukee – Madison corridor, which will also see various track upgrades. The St. Louis – Kansas City corridor will see upgraded bridges, crossovers, and improved grade crossings. On theÂ Seattle – Portland corridor, expect construction of a bypass track, grade separations, the addition of Positive Train Control, and seismic retrofits to King Station in Seattle, WA. The Portland Union Station will be upgraded. Between Fort Worth and Austin, new signals at grade crossings will be installed. TheÂ Charlotte – Raleigh corridor will receive track upgrades. Four new crossovers will be constructed in theÂ Raleigh – Richmond corridor. The California High Speed Rail Authority receives the largest chunk to construct track, signals, and stations. On theÂ Pacific Surfliner Corridor (San Luis Obispo – Los Angeles – San Diego), new track and crossovers will be constructed. View on Google Docs orÂ download an Excel file. *This construction summary is about as complete as the press releases from the White House. I reviewed each press release and copied the information that indicated where construction or upgrades of new or existing project components would actually occur. I excluded planning, environmental impact statements, engineering, and design components of the above projects. I compiled the most important information from the White House press releases into a spreadsheet. **UPDATED: For more CREATE and Englewood Flyover information, which was funded at $133 million, see page 2 of the Federal Railroad Administration’s summary handout (PDF) andÂ this discussion on Railroad.net. 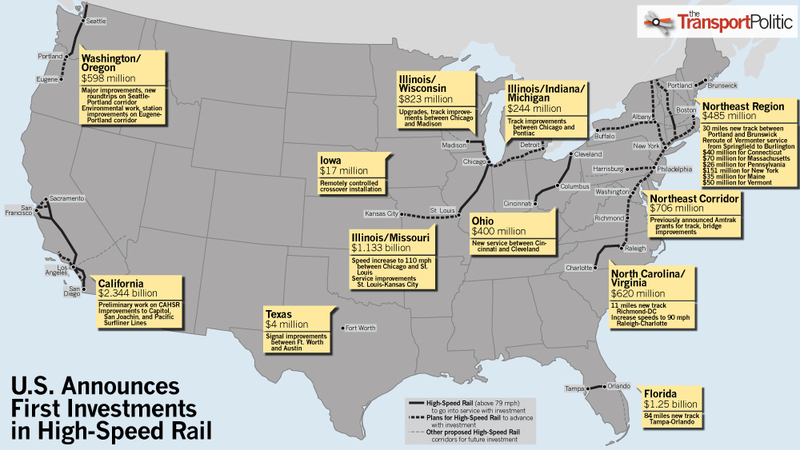 UPDATE 2: The Transport Politic has the most detailed and comprehensive information on high-speed rail project/corridor funding, aÂ better looking map than Ray LaHood’s map on LaHood’s blog. The White House Press Office posted separate press releases for each project here. UPDATE: Chicago Business (Crain’s) says Illinois to get $1.2 billion for high-speed rail projects, including money to build the Englewood Flyover connection (Project P1, see map), a major CREATE component (read more: PDF). CREATE is a multi-agency program to reduce the bottlenecks caused by mixing passenger and freight trains and at-grade road crossings. Tomorrow, President Barack Obama and Vice President Joe Biden will travel to Tampa, Florida, to announce the thirteen corridors winning a portion of $8 billion in funding for high-speed passenger rail projects. An Amtrak train heads south from Chicago Union Station. If Illinois receives stimulus funding for high-speed rail, we may see some faster locomotives and some new track emerging from the Chicago South Loop train yards. Vice President Biden, President Obama, and Department of Transportation Secretary Ray LaHood (from Peoria, Illinois), announced the high-speed passenger rail plan for the United States in Washington, D.C., in April 2009. Photo byÂ Scott Bernstein of the Center for Neighborhood Technology in Chicago, Illinois. One of the winners Infrastructurist predicts is the State of Illinois on behalf of a project to upgrade the tracks and rolling stock for the Amtrak lines Lincoln Service and Texas Eagle that run from Chicago to St. Louis. This is by far the state’s most prosperous route. The Illinois DOT has increased the subsidy to this route, increasing the frequency of service. In response, ridership has grown year over year over year (although the gain from 2008 to 2009 was only 6 percent). Will Americans soon travel with more convenience in the coming decade? I’m excited about Obama’s memorandum he wrote in his first week of office, on January 21st, 2009. In it, he calls for federal agencies to stop looking for legal ways to say no to requests for data, or in response to Freedom of Information Act requests. The United States Government is probably the world’s largest collector and holder of data. It probably stores more data and information than the internet (minus what the government publishes there). I hope I can expect an onslaught of data, but it must be accessible in multiple formats and in ways we can use. Saving spreadsheets is NOT distributing data. That’s protecting it and trying to make it harder to manipulate. It means providing raw access to tables and databases, providing APIs for custom queries, and XML feeds for simple and broad presentation. Perhaps we’ll need a White House Office of Data to coordinate with agencies about the formats and presentation and distribution methods they choose or will choose. I’m glad Obama’s transition team took the advice from the Electronic Frontier Foundation (EFF) on this one – they fight for, among many things, the rights of the internet and information and how access to both should be equalized and open. Read the EFF’s news article about this about-face from George Bush’s archaic information policies. To Obama: When you create that office, please consult the geniuses at EveryBlock for the Office’s “Public Consumption” division. They know how to package data for quick and informative understanding.